For boat & yacht charter ⚓ or Paraw ✅ sailboat rental ✅ We are the ones to talk to on Boracay Island. We gladly help you to any yacht or sailboat charter for sailing in the Boracay Island area. Most of all, we'd like to recommend our own boat for charter in Boracay; the "Misty Mornung." It's the sailboat with the touch of a smaller yacht, that you see on the pictures above. We offer trips around Boracay Island or offshore island hopping tours we recommend a maximum of eight sailing guests. You can charter this small yacht on an hourly basis, for a Paraw sunset sailing tour or for a whole day of island hopping. Of course you can also rent the sail boat "Misty Morning" for a week or your entire holiday. 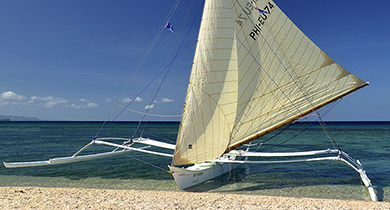 Sail boat rental in Boracay. Why charter with us? Because we offer exclusive charter sailing. We gladly help you to any boat charter you want. We do offer private & exclusive charter sailing. 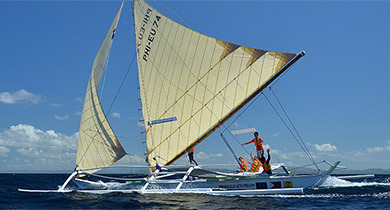 „Boracay Sailing“ is connected to the MASBOI. Boracay's head of sailing organizations. We are completely organized to charter any boat for you at any time. Boat charter in Boracay con be difficult, if you want to do it on your own. There are plenty of yacht charter & boat charter possibilities right on the beach. The thing is, there is no guarantee things do work out as people you talk to – first promise. 'Cause after you are gone, boats may have different crews and there will be no one in charge or to talk to. You book with “Boracay Sailing” - and it will all be organized. If you do want to charter a boat or rent a Paraw or even a Yacht, you want someone to rely on and organize it all. We are looking forward to meet you. It is, since we do offer exclusive Island hopping tours, of course your choice, where to sail to, what to do there and what to eat and where. If you want to rent or charter a Paraw sailboat, it is the same as basically with any Charter boat. We all are depending on the weather. It can be totally calm in front of Boracay Island, yet - the waves between Carabao Island and Boracay, will be high. Which means, no Island hopping to Carabao that day, but rather to visit the smaller islands in front of Boracay. For anybody the sea may look just calm. But is it really? Even a bit further out or on the other side of Boracay Island? Our experienced crews know how to read the waves as well as the sky, to be able to give a fairly reliable weather report for the next few hours. Yet, we also recommend to check the current weather report together with our captain, to discuss realistic possibilitys. If you want to charter a boat, a sailboat or rent a yacht; the weather is all that counts, before you do your booking. If you do want to rent a boat in Boracay Island, you might want to check, if it is equipped according to safety regulations. Means, does it have live belts with a functioning lock. Does the boat or yacht you plan to charter, have an engine? If yes, does it have a fire extinguisher? It only takes little time to check on that, yet - this time is extremely valuable. If you want to go sunset sailing with a bigger group of people, it will be best to call us, as few days before. The reason is, that there's always a lineup fot sunset sailing tours. Private & exclusive means, we also go out for smaller numbers of people. For one or two persons as well. And also for that, it takes time of planing as well as a reservation. If you like, we can organize (not price- included) what ever kind of drinks you would like to bring for your Boracay sunset sailling tour. We constructed and built a Paraw sail boat that has the typical Filippino Paraw outrigger design, yet offers the comfort of a small yacht. The Paraw "Misty Morning" is an offshore going charter- Paraw sail boat. Equipped with an engine, coolbox and safety devices. Perfect for a safe and enjoyable Boracay yacht - Paraw boat charter trip. Due to its outriggers the Paraw can land on any beach in the area. It has a lot of storage room to carry water, cooled foods and drinks for your picnic on the beach. See yacht charter Boracay video. On the Paraw outrigger wings there’s comfortable seating for a smooth sunset sailing trip for as many as 10 people.